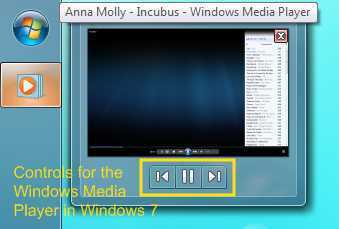 Windows 7 doesn't have the in-built function of the Windows Media Player - Quick Launch integration. All the versions of Microsoft's Windows operating systems prior to the Windows 7 OS have this functionality wherein when you minimise the Windows Media Player, it would go dock into the Quick Launch bar, provided Quick Launch - Media Player integration was enabled. Strangely enough, Windows 7 doesn't have this functionality. This was really a very important feature that saved us from a few more clicks and made controlling the Windows Media player very easy. Although there does exist ways of hacking into your system and make the Windows Media Player dock into the Quick Launch, but why do all that when Windows 7 provides you with a very different method of controlling your favourite Windows Media Player. All you need to do is just hover over the Windows Media Player tab on the System Taskbar, the preview windows that shows up for Windows Media Player has options for controlling your Windows Media Player. Although, the controls provided are very basic - Previous Track, Play/Pause, Next Track. It does serve the purpose and is really good for a change! Please let us know how you feel about this new functionality by leaving a comment.